It's hard to believe the DC EDGE Synchronized Skating program has grown from three adult teams in 2009, to the 17 teams it is today. Such an impressive expansion in a short time frame! 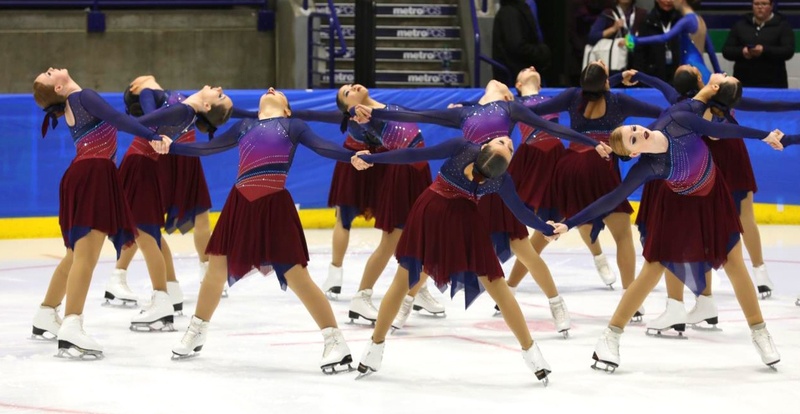 This year, their Junior level just wrapped up their first season as a team, placing 1st at the Eastern Synchro Championships, and finishing in 9th place at the 2018 U.S. Synchronized Skating Championships. 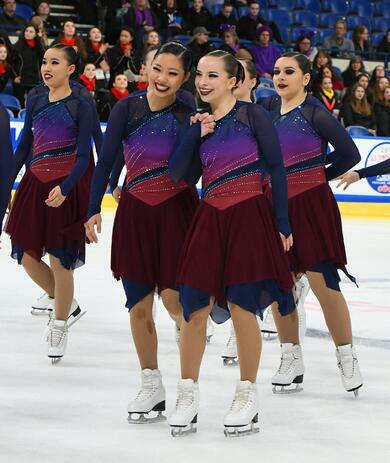 We chatted with coaches Christine and Jenny about the inspiration behind the skating dresses for their newly formed group. 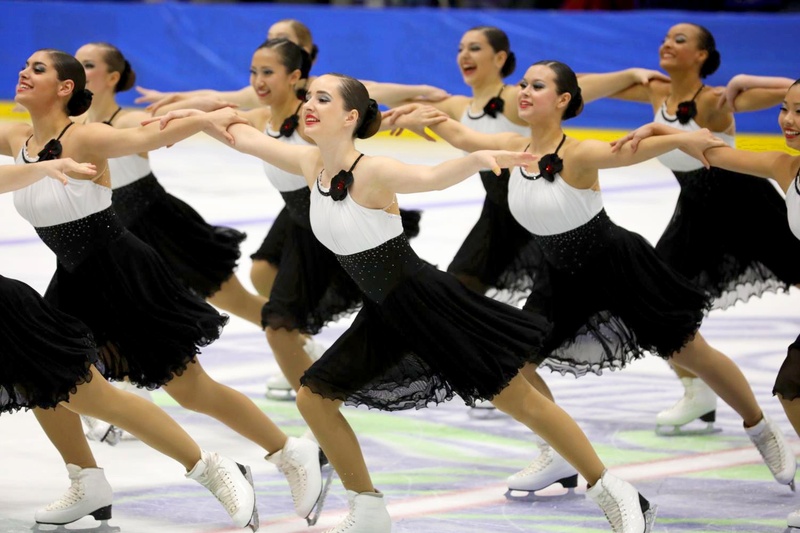 The music for the team's long program was derived from Charlie Chaplin films and other silent movies of the early 1920's, so they knew they wanted a black and white dress to match the theme. In addition to the colors, they picked a few design elements to reflect the character of Chaplin: both serious and playful. "We started with rouching on the bodice to reflect the tuxedo feel of the era," Christine told us. "We also wanted to add a playful pop of color to the flower on the neckline to showcase the fun and silly side of Chaplin. The choreography was a mix of serious and playful, so we wanted a dress that could reflect that." A charming silk flower at the neckline of their dress included a pop of red in the center - the only color on this black and white, silent film themed dresses! For their short program, the DC EDGE Junior team skated to a violin and cello remix of "Sweet Dream's (Are Made of This)," a dramatic and edgy take on the classic 90's Eurythmics hit. 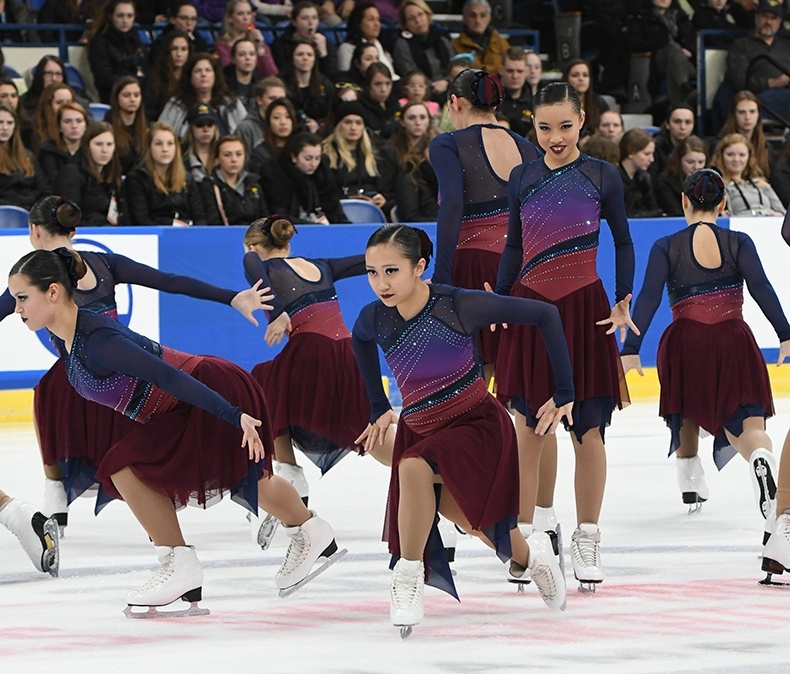 To begin the design process for their custom skating dress, Christine and Jenny started with a color scheme that reflected the mood of the music. "We knew we wanted something a little bit darker because the cello and violin bass in the music called for that," coach Jenny said. They landed on a unique color combination we don't see very often: deep jewel tones of navy, purple, and burgundy. Diagonal style lines and a jagged handkerchief skirt further infused the dramatic and tense mood of the music into their dress design. "We liked the idea of adding a color fade and incorporated some angles into the cut of the dress and skirt because the music felt both sharp and little tattered," Jenny explained. We love how this dramatic dress came together! Congrats on a successful first season, ladies! Check out more Q & A with the coaches below! This season we chose a violin remix of Sweet Dreams (Are Made of This) for our short program and a silent movie Charlie Chaplin medley for our free program. When we started this season, we knew it would be a learning experience for everyone. We really just wanted to enter the division feeling like we belonged. At one of our first events this season we had a disastrous short program and ended that segment of the competition in last place. It was challenging for the team to mentally recover from that, but the skaters worked really hard in practice to develop the consistency and mental confidence to push past that early event. 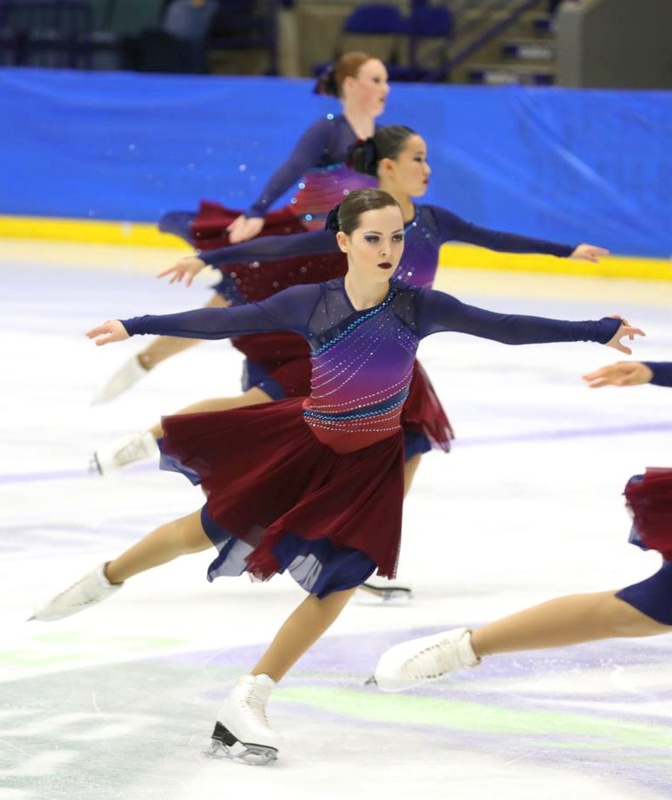 Two competitions later, at the Eastern Sectional Championships in January, they had a season's best performance in the short program that left them with an eight point lead over the competition. They won the event, which in and of itself was incredibly exciting, but the success in the short program felt like the real victory - it really showcased their growth and gave them the confidence to know that they really do belong. This was DC EDGE's first season in the Junior division and with a higher level came an extra day of practice, a second program to tackle and an increased level of difficulty to master. It was really challenging for both coaches and skaters to adapt to that and find balance.